U.S. stocks were poised for a lower open Monday after General Motors' bankruptcy plan received a federal judge's approval, and at the start of a week that will kick off second-quarter corporate financial reporting. At 6:50 a.m. ET, the Dow Jones industrial average, S&P 500 and Nasdaq-100 futures were lower. Futures measure current index values against the perceived future performance. David Jones, chief market strategist at IG Markets, said negative investor sentiment is likely to carry over from last Thursday's plunge. Jones described the decline in futures as "a follow-on from this feeling that has been dogging markets, that the recovery in the stock market got ahead of the overall [economic] recovery. There is continuing, almost building feeling now, that the stock markets went too far." Stocks fell hard Thursday, with the Dow losing 212 points, after a worse-than-expected jobs report squashed hopes for a quick recovery. Employers cut 467,000 jobs from their payrolls in June and the unemployment rate, generated by a separate survey, rose to 9.5% from 9.4%, according to a government report. 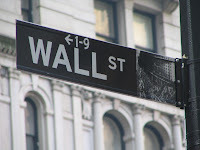 The S&P 500 surged over 40% through June 11 from its March 9, 12-year low, but the rally on Wall Street has lost steam. Investors will be looking closely at the books of big companies for an indication of where the economy is headed next. Dow-component Alcoa (AA, Fortune 500) begins the second-quarter reporting period on Wednesday. All financial markets were closed Friday for the Independence Day weekend. GM bankruptcy: General Motors (GMGMQ)' plan to emerge from bankruptcy, with a lot of help from the federal government, has been approved by a federal judge. Judge Robert Gerber gave his approval late Sunday after three days of hearings last week, saying it "is the only available means to preserve the continuation of GM's business." Economic reports on tap: The Institute for Supply Management releases its index on the services sector of the economy. The index is expected to have risen to 46 in June from 44 in May. World markets: Asian markets ended lower Monday, with Tokyo's Nikkei index down 1.4%. European markets fell in midday Monday trading. Oil and money: The price of a barrel of oil fell $2.94 to $63.79. Ahead of the G8 summit that starts in Italy on Wednesday, the dollar rose against the euro and pound but fell against the yen.